Mark your calendars for Monday, January 16th! 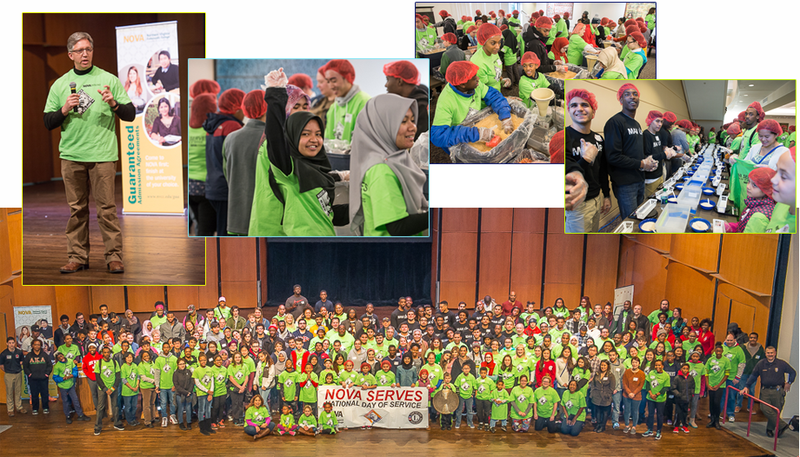 Join us for the 8th Annual NOVA SERVES: MLK Day of Service. The service event will take place on Monday, January 16, 2017 from 10:00 a.m. to 2:00 p.m. at the Alexandria Campus. This year’s event will consist of assembling 30,000 food kits in partnership with the Stop Hunger Now organization and the West Springfield Rotary Club. Join the movement to end hunger in our lifetime! Help us reach our goal to package 30,000+ meals. Working together we can create a world without hunger. *Stop Hunger Now- Since 1998, the organization has coordinated the distribution of food and other lifesaving aid to children and families in countries all over the world. Stop Hunger Now created its meal-packaging program in 2005. The program perfected the assembly process that combines rice, soy, dehydrated vegetables and a flavoring mix including 21 essential vitamins and minerals into small meal packets. Stop Hunger Now works with international partners that ship and distribute the meals in-country. The majority of Stop Hunger Now’s meals supply school lunch programs. Due to the ease of assembly and transport, meals can be shipped to areas in crisis. This process for distribution, through school feeding programs in hunger-stricken regions, is seen as a practical means to end hunger. Our registration is filled to capacity. Hope to see you next year! This entry was posted in MLK Day of Service. Bookmark the permalink. Both comments and trackbacks are currently closed.